This entry was posted in Tools on May 10, 2014 by Michelle Reid. 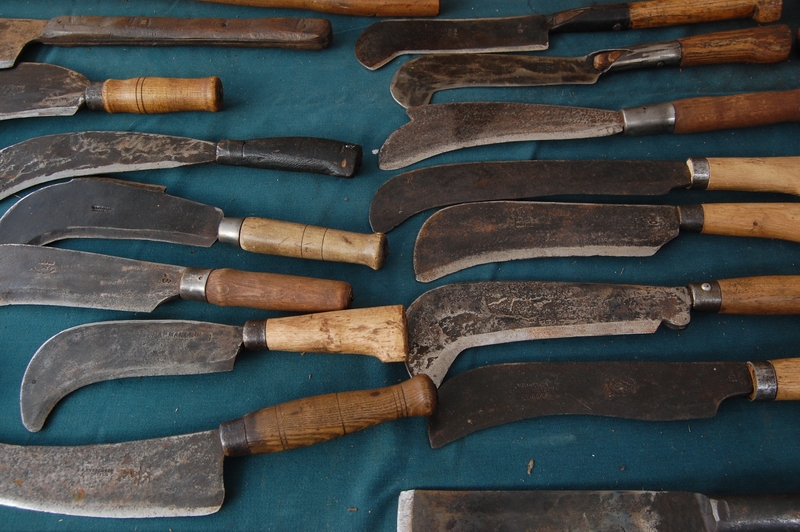 Billhooks are a tool for cutting or splitting green wood; they are something between a knife and an axe. They were traditionally used to coppice thin wood for animal feed and bedding, split hazel for making hurdles, cut fencing stakes, thatch roofs, make rough furniture and cut thin firewood, such as faggots which were used in bread ovens. In continental Europe they are a traditional tool for pruning the grape vines that were needed for wine-making. The hooked end makes it easier to catch cut pieces of brush and flip them in the right direction. 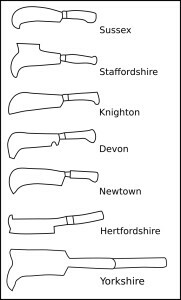 As the most widely available edge tool the billhook would also have been the principle weapon of self-defence for the medieval English peasant, and is often said to have been the main weapon used in the English civil war. Big orders were placed by the government as late as World War I, where they were used to clear scrub and cut stakes for trench construction. These days, volunteers on OCV tasks use billhooks mainly for trimming the side branches of hedge-laying stakes (snedding) and for hedge-laying itself. The billhook is a very versatile tool though perhaps one of the more tricky to use for us volunteers with weak 21st century arm muscles and not having had too much practice. Quite a lot of strength is required to use one effectively for significant lengths of time, and there is a risk of doing yourself or someone else serious injury with the sharp blade. The main risks are cutting your other hand, hitting your legs or cutting your fingers fishing one out of a bag of tools. In days gone by there were thousands of different patterns of billhooks used in different parts of the British Isles and in Northern Europe and other parts of the world, including those that were colonised by Northern Europeans. 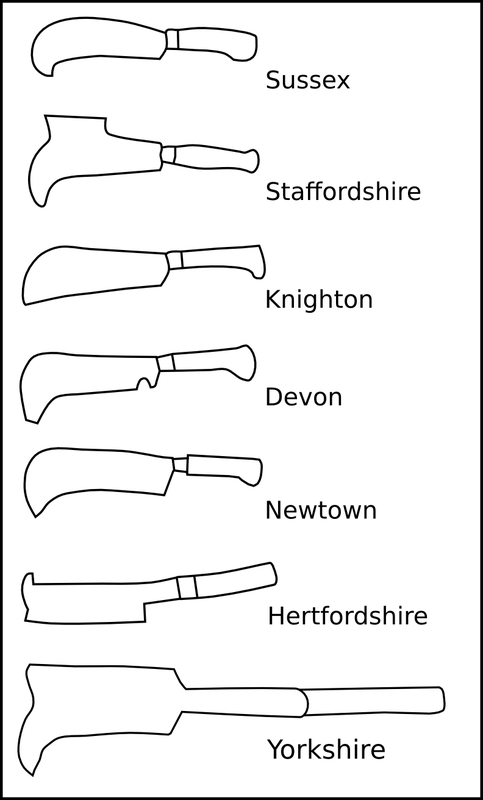 In many cases this would match the local style of hedge-laying, though it would be hard to say which came first since people would pass down both the tools and the technique. Although there are patterns named after many of the English counties, in fact, there was probably a different style being made by each village blacksmith. They eventually gave way to small manufacturers who made tools in larger numbers, perhaps with forges powered by waterwheels. There might only be a few of these tool makers in each county, so the tradition continued. In the 19th century, mass production took over from small manufacturers, and production of bladed tools took place in cities like Sheffield. 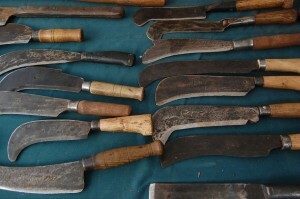 Farming was still not mechanised, and a large number of people still lived and worked in the countryside so there was still great demand for hand tools in the countryside and with different areas requiring different styles, the big toolmakers produced catalogues boasting of hundreds (and sometimes thousands) of patterns of billhook they had available. It’s sometimes still useful to know which is which. On OCV tasks that’s normally because we’ve managed to lose one and we want to know who saw it last. Or sometimes we end up with a bit of particularly tough bit of hedgelaying that means we have to find out who’s got a Yorkshire billhook – the only one that can be used two-handed.